You know that you’re back on Khaosan Road when you are walking down the street at 1am and you see a mom with her little kid in a stroller, standing amongst the prostitutes and drunken teenagers. We had worked our way back to Bangkok so that…wait for it…we could catch our flight back to the US of A! That’s right people, the crazy ride is returning back to the homeland. I suppose it was a combination of being tired of the vagabond lifestyle, combined with the whole stock market swallowing a good chunk of our fun money. So two days after our arrival at infamous Khaosan, we were jumping on a plane set for Seoul, South Korea. There’s a great travel expression that goes something like ‘half of the journey is getting there’, which is to say that the part of traveling when you’re on the road is supposed to be just as interesting as the destination. As you know from most our posts about horrifying bus rides and fun-filled train rides, that is entirely true. 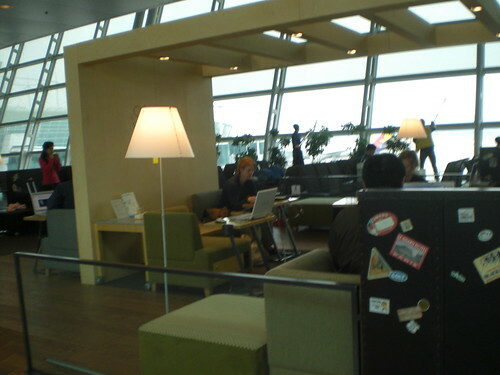 Well, Incheon Airport in Seoul, South Korea could probably be a destination in itself. With cafe’s complete with lounge chairs, gourmet restaurants with reasonable prices, and free wi-fi cafes in the terminal, we were happy to spend a 10 hour layover there. We thankfully slept a good 5 hours in the Airport Garden Hotel and woke up with enough time to grab a lovely meal of authentic kim chi and tuna-veggie sushi. After that we jumped back on our Asiana Airlines flight to cross over the Pacific. Generally considered the worst trip a person can make, crossing the Pacific usually entails leg pain, boredom, yucky food, and, if you’re lucky, a fitful night of sleep. Step in Asiana Airlines with it’s healthy, yummy meals, copious drinks, and on-demand mini-TV’s at every seat, and we were the happiest travellers who ever suffered a night of insomnia. And just as fast as a million hours can past, we were on the ground in San Francisco. Looking ravashing after a long flight. Landing in the USA did not provide the shocker that we were expecting. Perhaps landing in a city with a 33% Asian population had something to do with it. It didn’t feel like we were all that far from Bangkok or Seoul. The rentry jolts were slow in coming. They came when we asked for an adjustment to our food order and the waitress not only understood, but gave us what we wanted. It came again when we drove down a road and noticed that it wasn’t littered with trash. And again when a car stopped as we entered a crosswalk instead of using us for target practice. I expected to be a little sad about returning to my home country, but I’m finding that I’m not sad at all. I think most of you would assume that there would be some depression associated with the adventure being over, and you’re not wrong. I would be depressed, if the adventure were over, which it isn’t. The adventure has just taken on a different path. It’s been a week on US soil, which is not nearly enough time to reflect, but this idea has been formultaing in my head since before I left. It’s this idea of how fortunate I am. Not in the hokey “oh I’m so thankful for all my blessings” way. But in a way that means, I got all of these priviledges for no reason. Not because I’m smarter, or more talented, or more capable of putting all of these advantages to good use, but because I got really lucky. It’s funny to think of a basic education, regular meals, access to clean water, organic food, and recycling centers as a gift and an advantage, but they are. And if you doubt that, you only have to think of what it would be like without them. Imagine the US without recycling centers, clean water coming out of the tap, plumbing, and free public schools. So that’s where I’ve been and it now seems to me that it would be completely insane, presumptuous, and ungrateful of me to not at least make every effort in the world to put all of these advantages to use. Otherwise I’ll either die having done nothing of lasting benefit for the world or worse yet I’ll be reincarnated into some dung beetle after the gods decide that I wasn’t smart enough live a decent human life, so I have to re-learn the difference between appreciating and requiting. And that concludes this strange and incredibly loose philosophy that is currently dictating my life. And despite irresponsible banks, poor economies, and really cold weather (keep in mind, I just came from Thailand), that future life is looking pretty good. Because now there’s a new measure to my success that isn’t quite as definable as a title or a paycheck, but has something more to do with accomplishment. With regard to all of the ills associated with life in the U.S., to paraphrase Churchill on capitalism: the U.S. is the worst country in which to live, except for all the others. As you two certainly demonstrated, there are a lot of very interesting countries in the world with some remarkably interesting characteristics. But as you indicate, there’s no country quite like the US of A (with apologies to your foreign readers who might disagree) (or then again, might not). What a wonderful journey and lesson we took with you all. Thank you for the incredible trip. We welcome you home (where ever that may be). remember me? your dwarf friend you met in Bucuresti and Brasov?! I would have wished to read you longer! 🙂 you made me travel every day i went on your blog, it was like escaping my routine. I have thought a lot about you, about where you were. I hope you enjoyed being nomads for a while. It is so refreshing to feel free and to be an international citizen. When I came back home at the end of June, I came back to work, then to study. I went backpacking in Costa Rica in January but it was very short (nevertheless I had the chance to live an Eathquake..). I can’t wait for my session to be over and flight again!!! And you, are you planing to stay home? Give me some news, i wish the best for you both! Welcome back! What are your plans now?